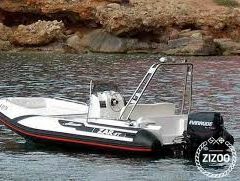 The Zar 47 is an excellent speedboat for day cruises around the Balearic Islands in Spain. Explore the Bay of Puerto Pollensa and much more with your friends, family, and loved ones aboard this zippy and agile vessel. This boat features a centrally located steering station with ample room to move about. It is also easy to handle and performs well. It is great for day trips around the region, and for snorkeling, diving, or beach hopping. It is an excellent yacht charter for your next holiday in the Balearic Islands.